What is SLA and why use it? The service level agreement (SLA) is part of the service contract between two or more entities in which the level of service provision is formally defined. In practice, the term is used in the context of time to provide a service or a particular task. For example, if company “A” hires a delivery service level of 95% in less than 24 hours from Company “B, 95% of the services have to be made in less than 24 hours. 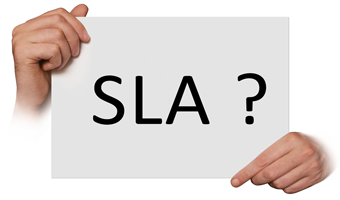 The SLA’s history dates back to the early 1980s, with the telephone operators. A SLA contract includes information about: establishing services, performance, problem management, accountability of both parties, guarantees, emergency measures, alternative plans, plans for temporary applications, monitoring reports, security, confidentiality and cancellation of the contract . Availability. Ex: During a year, the system may be unavailable at most for 8.7 hours (99.9% availability). This item will be divided into planned stops (for periodic maintenance) and unplanned (errors, problems, etc.). Incidence of errors. Ex for a year, the system shall not register more than one error per 1,000,000 processed transactions. Performance. Ex: The system should process the payroll for a maximum of 2 seconds every 10 servers processed. Priorities. Ex requests classified as “urgent” should be resolved within 8 hours, “important” requests will be resolved within 24 hours, and “routine” requests will be resolved within 72 hours. The compliance of an SLA is linked to indicators for automated collection and monitoring of the contract items. These indicators should include means of security and audit that add reliability to the indicator. These indicators should be available for both the client and the supplier of the contract, although the mechanisms of monitoring indicators can be deployed in the client and in the supplier.